As you step from the vibrant riverfront of Phnom Penh along the banks of the Tonle Sap, prepare yourself for a fusion of innovation and tranquility. As you enter the calming ethereal design of the lobby, you immerse yourself in form and comfort. From the start, your stay at this minimalist 16-room hideaway is urbane and relaxed. 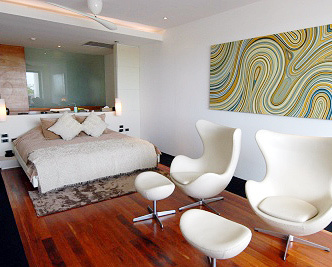 Consider yourself home at The Quay – Phnom Penh’s first environmentally sound hotel. An ideal base in exploring Phnom Penh’s vibrant energy and hidden charms, The Quay is a pleasant stroll away from top Phnom Penh landmarks such as the National Museum, the Royal Palace, the Silver Pagoda and quaint street dotted with charming cafes, designer shops and art galleries. The Quay in larger map.